Call Capri Carpet For Pricing! Made from 100% new materials, Healthier Choice contains anti-microbial Ultra-Fresh® which prevents the growth of odor causing mold, midlew and fungus. It has an integral moisture barrier which prevents spills from penetrating through the cushion. And, it comes with a limited lifetime warranty (ask for details). Thickest, most luxurious cushion provides unparalleled comfort and durability for your home. Mohawk's own engineered carpet cushion is made from a combination of ViscoElastic Memory foam and premium white urethane foam to produce a cushion as tremendously soft as it is durable. Contains Spill Safe moisture guard that keeps spills from seeping into the cushion. Plus, there is no need to worry if spills aren't treated immediately because the antimicrobial additives guard against the growth of mildew, mold and fungus. 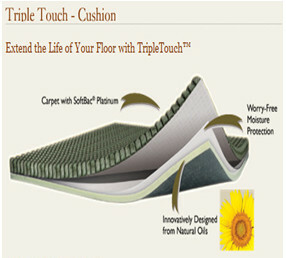 And, SmartCushion creates quieter, more energy efficient rooms by improving your carpet's sound insulation qualities. 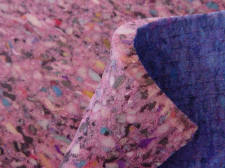 SmartCushion is a great product under SmartStrand™ and Wear Dated™carpets! Plus, it will extend many warranties to 20 years - ask us for details. This Shaw product actually doubles the texture retention warranty of Shaw 4 and 5 Star Carpet (ask us for details). 7/16" - Premium Touch 8 lb. 7/16" - Ultimate Touch 10 lb. 7/16" Premium Touch 8 lb. 7/16" Ultimate Touch 10 lb.